In this paper, impact of crosstalk and fiber nonlinearities has investigated to enhance the signals strength for 260 channels with the data rate of 10 Gbps. Further, power amplification has also maintained with the arrangement of RAMAN–EDFA–RAMAN hybrid optical amplifier for transmission distance of 65 km. Furthermore, analysis has also observed in terms of received crosstalk and different power level of fiber nonlinearities for channel range from 1 to 260. Channel spacing is also main concerned for super dense optical communication which has also resolved in this proposed simulation model. In this way, it is recommended that this proposed model is really helped out to the network operator to enhance the future super dense optical commutation process. Optical communication data rate up to 100 Gbps has been demonstrated to control the universal telecommunication traffic. 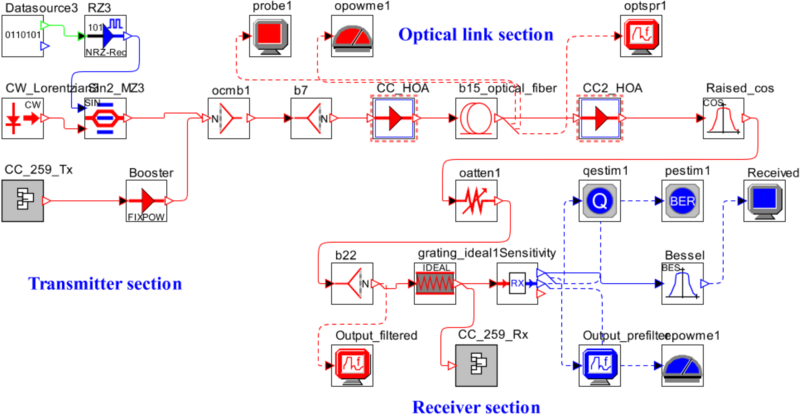 The major challenges with the high spectral data transmission are to get the desired parameters with tolerating effect of fiber nonlinearities and crosstalk [1, 2, 3, 4]. Least effect of fiber nonlinearities, dispersion and crosstalk are also supported to optical signal to noise ratio (OSNR) which is main acceptable aspect for super dense optical communication system [5, 6, 7, 8, 9]. Today’s super dense optical communication losses of 0.15 dB/km has been attained with typical effective area of 105 µm2 which has also shown the limited effects of macro and micro bending losses with the support of single mode fiber (SMF) [10, 11, 12]. In super dense long distance optical communication, Kerr fiber nonlinearity is the main dominating effect which was resolved with the implementation of coherent compensation techniques . Digital back transmission (DBT) is the most acceptable technique to control the fiber nonlinearities, which is placed near the transmitter and receiver side before the distortion . On the other hand, lower order perturbation compensation is also the superior approach to mitigate the effect of intra and inter channel losses for upgrade the signals strength for super dense optical communication . In the couple of years, some of the research group has developed best acceptable techniques to control the dominating effect of dispersion and power reduction for dense communication, which has really supported to this research work [16, 17, 18]. So far, the details knowledge of the above mentioned techniques are required to enhance the signals strength and all the above proposed techniques has also been implemented for wavelength division multiplexing system, no use in super dense optical communication is shown till now for the future super dense optical aspects which is also main concerned. So this paper has considered all the major aspects for proposed super dense optical communication and presentation of this research work is also given in four sections. First, second, and third section are given the details knowledge of introduction, proposed simulation setup, and analysis and discussions. Further, final conclusion is also explained in section four respectively. 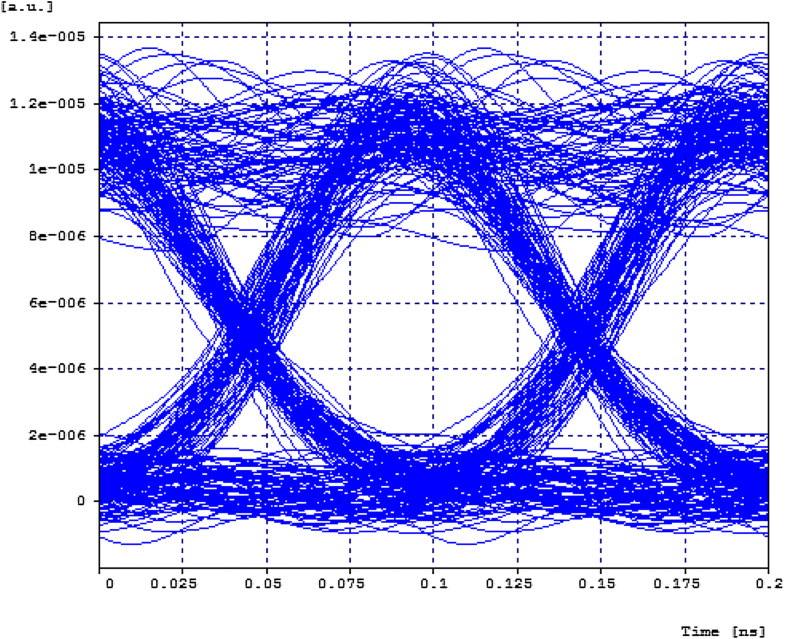 Simulation setup for analysis the effect of crosstalk and fiber nonlinearities for 260 × 10 Gbps super dense communication system is shown in Fig. 1. 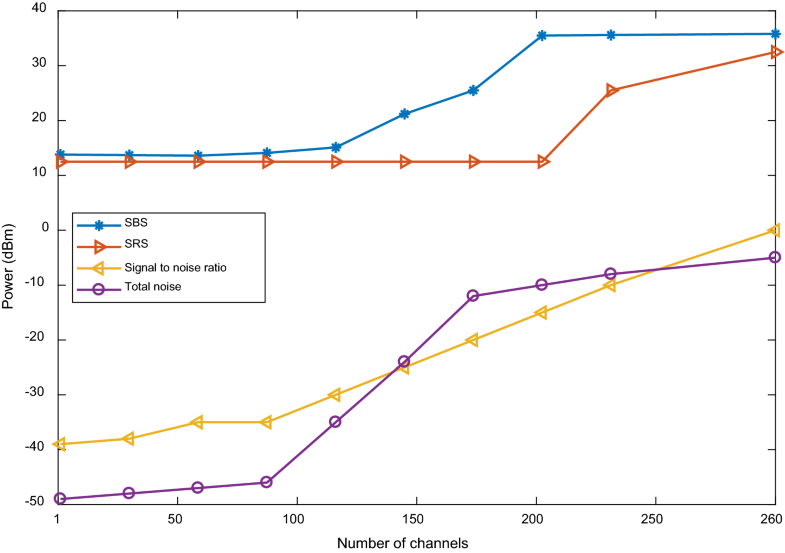 Channels are arranged with channel spacing of 100 GHz to neglect the effect of intersymbol interference (ISI) which also leads to dispersion and crosstalk. Optical signals are received with the support of data source, RZ electrical drive, sin-square modulator, and CW laser source for one transmitter. This process is also repeated for rest of the transmitters to get the optical signals. Converted optical signals are combined with super dense combiner, which is also shown in Fig. 1. 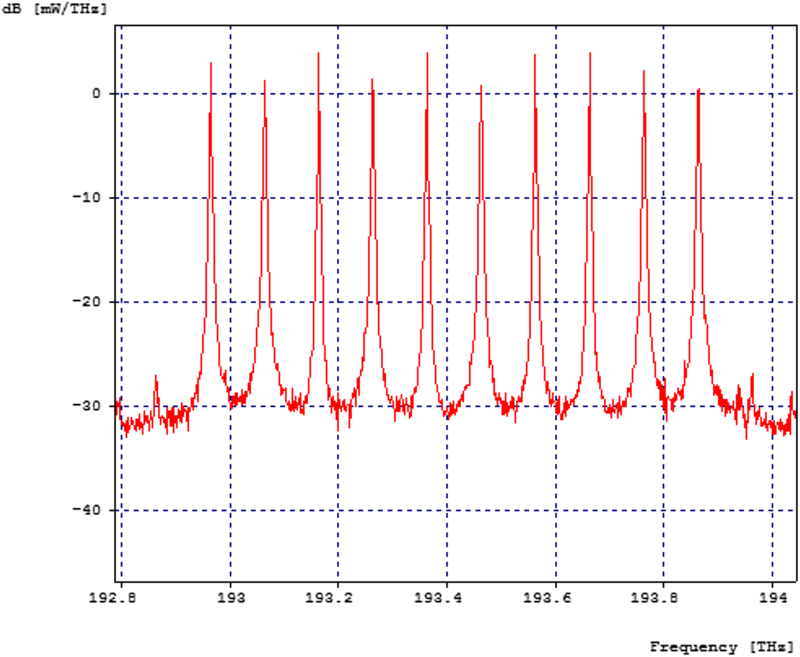 Power meter, optical spectrum analyzer and other measuring instruments are also used during the communication process to observe the signals characteristics. Two sets of RAMAN–EDFA–RAMAN hybrid optical amplifier are also placed in optical medium with fiber length of 65 km to maintain the uniform power level throughout the super dense communication process to neglect the effect of fiber nonlinearities and crosstalk. Use of attenuator and fiber Bragg grading (FBG) are the main instruments to mitigate the effect of crosstalk and fiber nonlinearity which are arranged near the receiver section. Received optical super dense signals are separated out with the support of super dense optical separator which further link to PIN photo diode and low pass filter to get the original electrical signals to observe the effect of crosstalk and fiber nonlinearities with the support of different measuring instruments. Final simulation results are shown from Figs. 2, 3, 4 and 5 to get the acceptable rating outcomes for the betterment of super dense communication system. 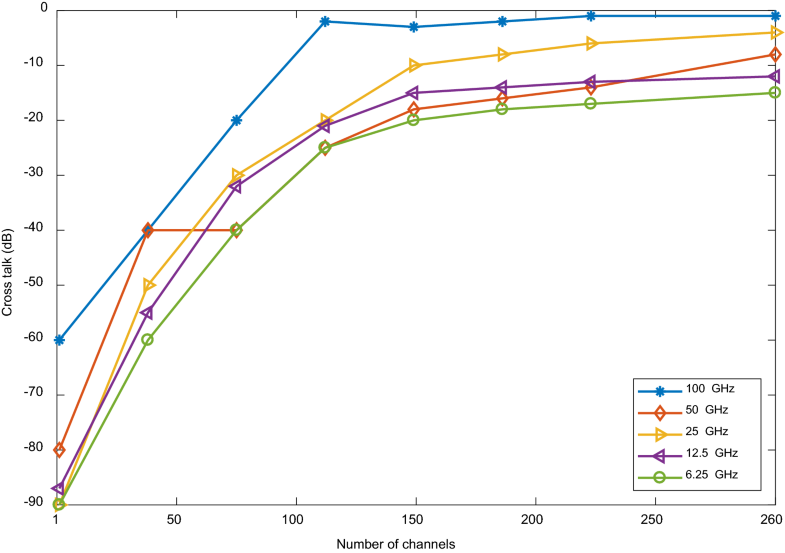 Figure 2 is shown the outcomes in terms of crosstalk with respect to number of channels with the condition of different channels spacing. Further, recorded value are given as − 60 to − 1 dB for 100 GHz channel spacing, − 80 to − 8 dB for 50 GHz channel spacing, − 87 to − 12 dB for 25 GHz channel spacing, − 90 to − 15 dB for 12.5 GHz channels spacing, and − 90 to 6.25 dB for 6.25 GHz channels spacing respectively. In the similar manner, power level of different fiber nonlinearities is observed from Fig. 3. 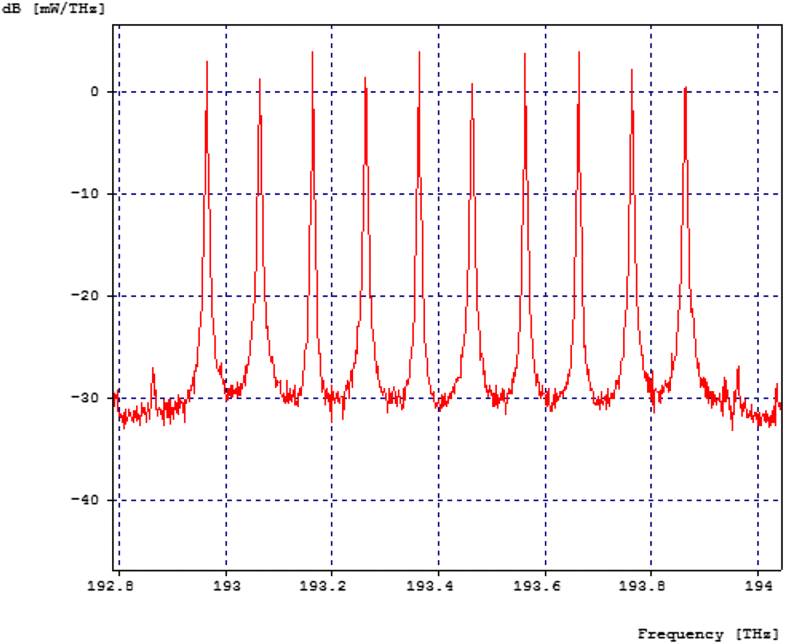 The noticed value are given as 12.5 to 32.5 dB for SBS, 13.8 35.8 dB for SRS, − 39 to − 1 dB for signal to noise ratio, and − 49 to − 5 dB for total noise for 1–260 channels. Here, it is analyzed that recorded values are most suitable for the support of super dense transmitting signals due to suitable power amplification from RAMAN–EDFA–RAMAN hybrid optical amplifier which is the prime concern for super dense communication. In fact, proposed HOA is the strong tool to maintain the uniform power amplification which uniform power amplification is shown in Fig. 4 for the betterment of transmitting optical signals. Furthermore, eye diagram of the signals are also received after the transmission distance of 65 km at the receiver section to observe the mitigating impact of crosstalk and fiber nonlinearities in Fig. 5. 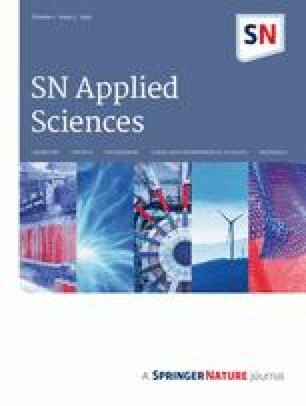 This paper has explored for the first time, best of our knowledge, mitigating effect of crosstalk and fiber nonlinearities for 260 × 10 Gbps super dense wavelength division multiplexing (SD-WDM) system. RAMAN–EDFA–RAMAN hybrid optical amplifier (HOA) has played the main role to control the dominating effect of optical domain for 65 km optical communication distance. Recorded outcomes have really supported to the propose system and it has also recommended that this model will be showing massive impact to upgrade the service quality of the network provider for super dense communication. Further, authors are also declared that they have no conflict of interest.